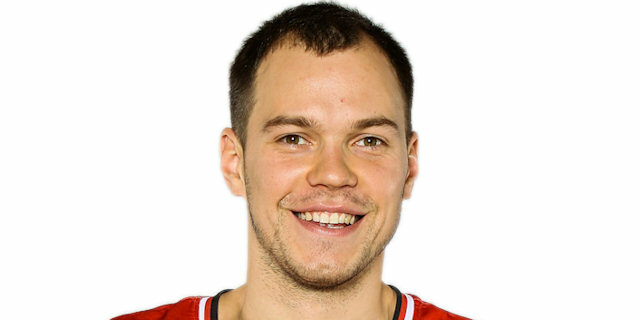 Lietuvos Rytas Vilnius picked up its first victory of the Turkish Airlines Euroleague season by downing Partizan mt:s Belgrade 69:61 at Siemens Arena in the Lithuanian capital on Thursday. Rytas improved to 1-2 record and moved up to fourth place in Group D, while Partizan remains winless after three games and shares the bottom spot with Brose Baskets, which the Serbian champs host next week. Rytas used a 16-0 run that bridged the first and second quarters to open up a 9-point lead and take control of the game. Their advantage reached as many as 12 points half-a-dozen times during the game, and Partizan never really threatened to make a comeback. 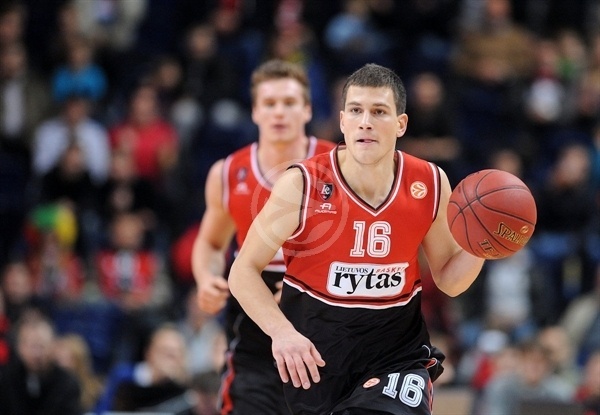 Renaldas Seibutis and Predrag Samardziski led Rytas with 14 points apiece. 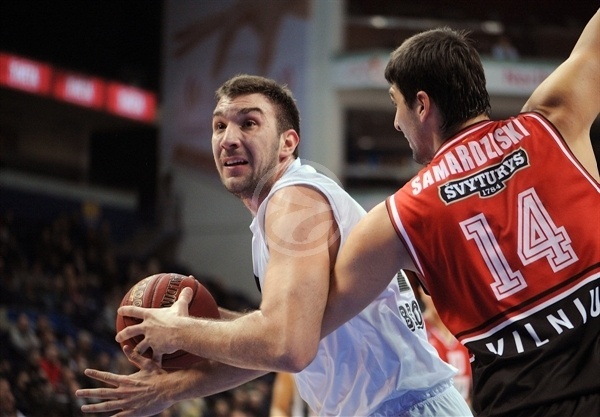 Mindaugas Katelynas finished with 10 and Nemanja Nedovic with 9 points. Vladimir Lucic scored a game-high 17 points for Partizan, Dragan Milosavljevic added 12 and Drew Gordon amassed 8 points plus 7 rebounds. Predrag Samardziski scored twice from inside the paint, a turnaround jumper and a tip-in, to start the scoring in the opening minute,and Seibutis hit a jumper for an early 6-2 lead. On the other end, however, Dejan Musli scored twice from close range and Lucic layup tied the game at 6-6. A Kaletynas layup put the hosts back up, but Lucic hit a jumper and added a fast-break layup and Musli’s dunk made it 8-12 after four minutes. Tough trademark defense from Coach Dusko Vujosevic’s team allowed only one Rytas field goal in a span of more than four minutes, while Gordon’s put-back made it a 6-point advantage for the first time. Janis Blums ended home team’s drought with a triple for 11-14, but Gordon’s jumper-plus-one kept the visitors ahead. Rytas missed a chance to erase a deficit with couple of missed open three-pointers before Djordje Gagic split free throws made it 13-20, but Seibutis and Leon Radosevic from the charity stripe and Nemanja Nedovic with a layup did cut the deficit to 18-20. Seibutis then used a technical foul on Vujosevic to score 5 points in the final 5.4 seconds of the quarter – a couple of free throws and a buzzer beating triple – giving Rytas a 23-20 advantage after 10 minutes. 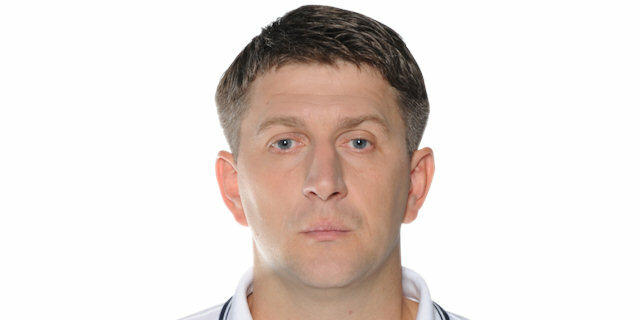 Now it was Rytas’s defense dominating, preventing the Serbian champions from converting on their first seven possessions of the second quarter. During that time, Radosevic scored on a pick-and-roll and Samardziski from underneath to extend Rytas’s run to 14 unanswered points. 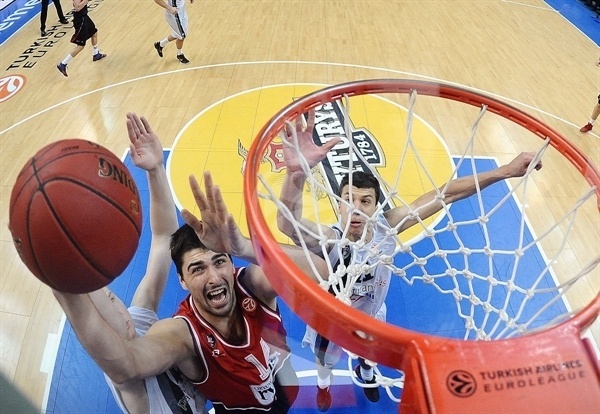 Dejan Ivanov’s toughness on the offensive boards gave the hosts 29-20 lead. 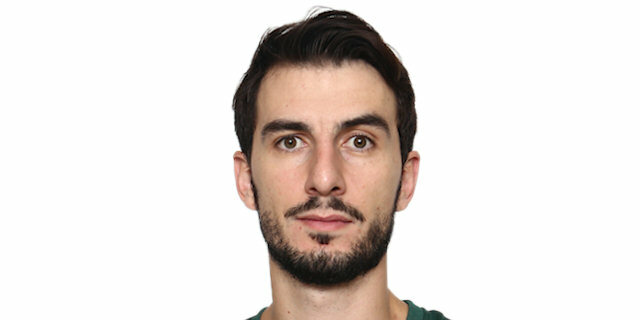 Musli’s dunk – Partizan’s first points in more than five minutes – ended a 16-0 run and Bogdan Bogdanovic hit a long jumper trying to give Partizan a spark. However Rytas answered through Seibutis and Ivanov and forced couple more turnovers to keep the lead at 33-24 with four minutes to go in the half. Dragan Milosavljevic layup and 2 free throws cut the lead to 5 points, but Musli and Lucic failed to bring Partizan even closer, hitting only 1 of 4 from the charity stripe. Neither team scored a field goal in the final three minutes of the half before Blums hit a long triple in final seconds of the half to give Lietuvos Rytas a 40-31 halftime advantage. A Samardziski slam-dunk on the first possession of the third quarter gave Rytas its first double-digits lead. Davis Bertans answered with Partizan’s first triple of the night, but Seibutis and Samardziski made it 46-34 two minutes into the second half. 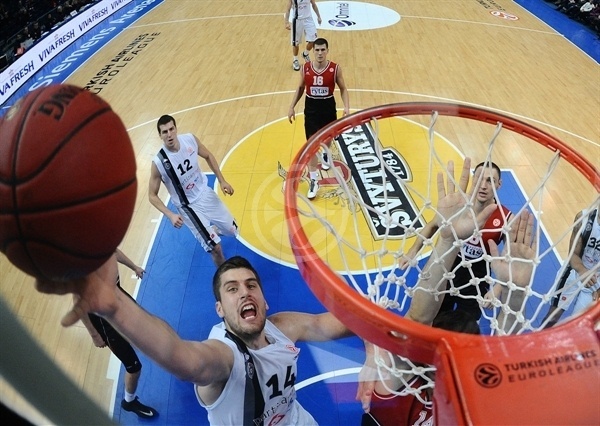 Leo Westermann hit a jumper, but Partizan offensively could not muster up much more than that. 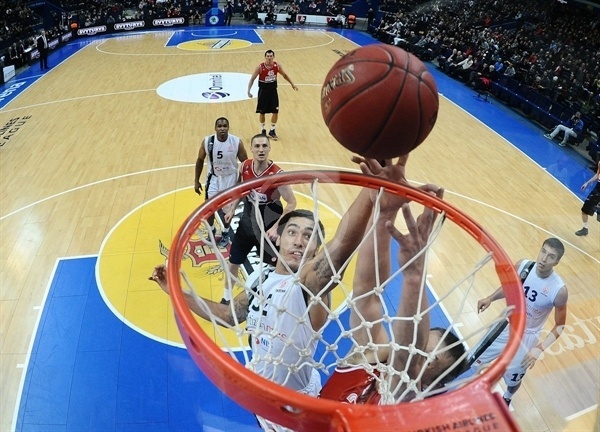 Samardziski’s drive helped Rytas make it a 12-point game before Lucic and Gordon briefly cut it back to 49-41. 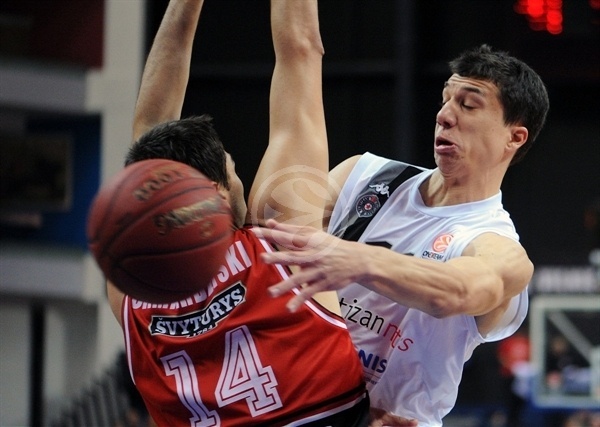 The hosts failed to take full advantage of Partizan’s foul trouble; Jomantas and Nedovic hit only 3 of 6 free throws. A Radosevic layup and a jumper did maintain the advantage at almost magical 12 points, but Gagic scored a layup high off the glass and Milosavljevic hit a triple to bring Partizan within 55-48 entering the fourth quarter. Steponas Barbrauskas was scoreless through three quarters, but hit a triple at the beginning of the fourth to make it a 10-point game. Nedovic hit a three-pointer from the right corner a minute and a half later, extending the lead to 61-49. Partizan answered with Milosavljevic and Lucic drives, but Katelynas scored a lovely reverse layup to make it 63-53 with six minutes remaining. After two scoreless minutes, Bogdanovic hit a triple to keep visitors’ hopes alive, but Nedovic immediately scored a driving layup on the other side. Milosavljevic hit 2 free throws to cut it to 65-58, but Katelynas’s fadeaway beat the buzzer and a Milosavljevic turnover helped Rytas enter final two minutes holding a 9-point lead. Westermann hit 1 of 2 from the line and Musli and Gordon scored inside to bring Partizan closer. Lucic scored on a fast break with 30 seconds to go to trim the gap to 67-61, but it was too little, too late, as Katelynas free throws 15 seconds later secured for the hosts their first victory of the Euroleague season. "The most important thing is that we won the game even though it wasn’t a nice game for the spectators. We had to win at home and a lot of pressure fell off of us now." "This game was very important for both teams. The tension blocked players from making wise decisions. Everybody makes mistakes..."
"We are happy that we won in front of our fans. The game was tough and we were mentally stronger in the key moments." "We made too many stupid mistakes and didn’t execute what coach told us."